I love mine served with neeps and tatties. Neeps is mashed up turnip or swede, usually with a wee bit of milk, and tatties are potatoes. I prefer mine mashed with lots of butter. Take a bit of the haggis, neeps and tatties on your fork at a time for a real feast. Even better washed down with a wee dram of whisky - some people like to add some whisky. In a traditional Burn's supper it will be piped in by a bagpipe player and an esteemed guest will address the beastie with some words of Robert Burn's before it's served and toasted with a malt. Eating in has a hummus with haggis and pine nuts meal, a chicory with haggis and pomegranate and a haggis nachos dish. The perfect haggis should not be too moist but should not be too dry either. It should be slightly spicy due to the cayenne pepper ingredient. It makes a delicious moist stuffing for chicken and how to make this can be read on our Haggis Stuffed Chicken Recipe page. 1. Clean the stomach bag thoroughly and soak overnight. In the morning turn it inside out. 2. Wash the pluck and boil for 1.5 hours, ensuring the windpipe hangs over the pot allowing drainage of the impurities. 3. Mince the heart and lungs and grate half the liver. 4. Chop up the onions and suet. 5. Warm the oatmeal in the oven. 6. Mix all the above together and season with the salt and pepper. Then add the cayenne. 7. Pour over enough of the pluck boiled water to make the mixture watery. 8. Fill the bag with the mixture until it's half full. 9. Press out the air and sew the bag up. 10. Boil for 3 hours (you may need to prick the bag with a wee needle if it looks like blowing up!) without the lid on. 11. Serve with neeps and tatties. 1. Boil the meat for about an hour and allow to cool. Then chop the meats into wee pieces but grate the liver. 2. Toast the oatmeal in the oven in a shallow dish and shake occasionally. 4. Pop into a well greased glass bowl and cover with several layers of foil and steam in a pan of boiling water for two hours. The Book Maw Broons Cookbook has a delicious vegetarian haggis recipe that uses flour, breadcrumbs, onion, butter, lentils, oatmeal, eggs and vegetable stock and is easily made in a pudding basin. 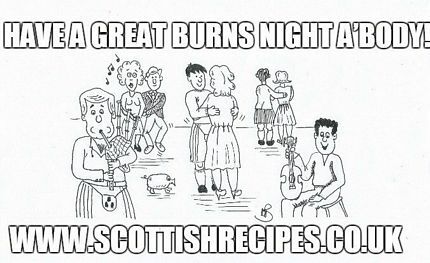 Buy Maw Broon's Cookbook at a discounted price and with free delivery available. An alternative can be found in Caribbean Food Made Easy and is called McTumplings in honour of Levi Roots Caribbean and Scottish roots. Levi Roots' real name is Keith Graham, a fine Scots name. This dumpling type recipe is also inspired by the boxer Mike Tyson and his famous thump or tump. Levi Roots adds various ingredients such as cinnamon, Scotch bonnet red chillies, coriander and spring onions. Mums Know Best: The Hairy Bikers' Family Cookbook has a haggis samosas recipe. Delia's Happy Christmas has a delicious haggis pie served with tatties, neeps and whisky sauce. 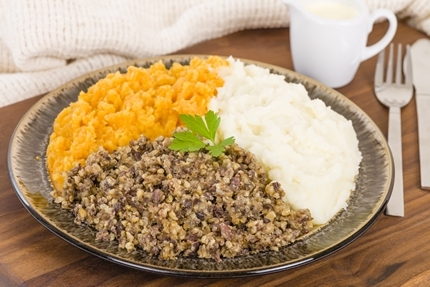 A traditional haggis recipe is traditionally made with a sheep's stomach which has been stuffed with the offal of the sheep, the heart, lungs and liver. Other traditional ingredients include suet, oatmeal and seasonings. Scottish butchers vary their ingredients and often add a secret ingredient. Many now make vegetarian haggis and it is even possible to buy it tinned. Some haggis are now encased in man made casings rather than the traditional sheep's stomach. 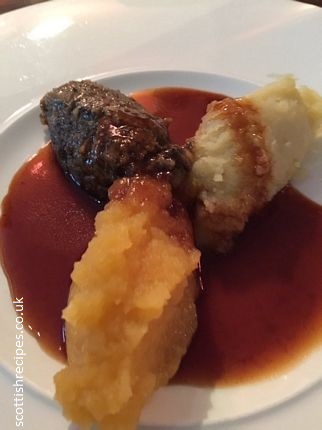 It forms part of other dishes such as Balmoral Haggis which is a fillet of chicken breast stuffed with haggis which may have been soaked in malt whisky by some chefs. A popular chip shop dish throughout Scotland is the Haggis Supper which is a long haggis pudding, shaped like a sausage, served with chips. Some chippers, as chip shops are known by Scottish people, serve the traditional large round haggis puddings, though these tend to be too large for most appetites and some find them too spicy. It is nicknamed the Great Chieftain o' the Puddin' Race. The origins of this nickname comes from the poem Address to a Haggis by Robert Burns, the national poet of Scotland. 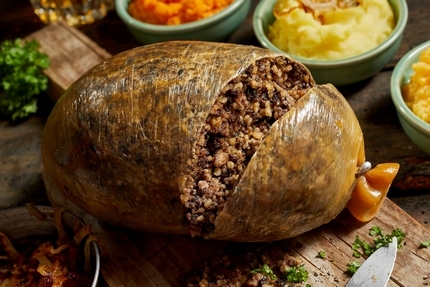 It is thought that the origins of the word haggis comes from the old Scots word hag which meant to chop or to hack. The first haggis recipe was printed in the 1787 edition of a cookery book by Mrs McIver. Another was published in 1826 in The Cook and Housewife's Manual. Variations on sale in butchers shops in Scotland include traditional, vegetarian, venison and Indian spices rather than curry. A common haggis myth is that it was given to the Scots by the French during the Auld Alliance. It is more likely that Scotland gave it to France. This misconception of the French giving Scots it may have originated because their word for minced meat is hachis. Haggis was called le pain benite de l'Ecosse in France during the Middle Ages. Haggis Dogs were invented by Mark Shaw of Stepps in Lanarkshire, Scotland. They are much like hot dogs but the meat is a mixture of pork sausage meat and haggis. Mark Shaw sells his from his mobile catering van haggis-n-neeps. They are served with his homemade turnip chutney rather than tomato ketchup and mustard. An unusual Burns Supper took place in January 2011 at the top of Mount Kilimanjaro. 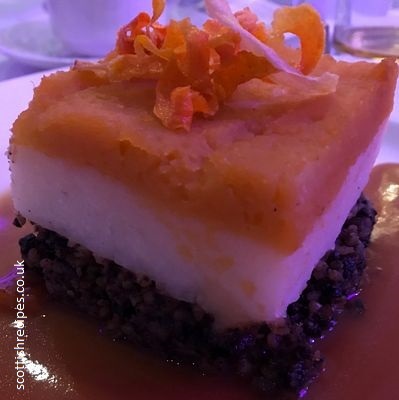 This Burns Supper fed 20 climbers which included Scottish celebrities such as comic and radio presenter Fred MacAulay and Andrew Fairlie the Michelin star chef at Gleneagles Hotel. Cooking this Burns Supper of haggis, neeps and tatties at Mount Kilimanjaro gave Andrew Fairlie a challenge since the cooking times were longer because of the different boiling point of water at high altitude. There was still an address to the haggis with a whisky toast and a piper played at the summit. This Burns Supper charity fund raising event was organised by Hospitality Industry Trust Scotland and the haggis provided by Simon Howie butcher of Perthshire. Buy haggis online at The Scottish Store who are exporters of MacSweens haggis, vegetarian and Grants tinned within the European Union. To order online visit their website www.scottish-haggis.net or call their order line on 01786 812551. Haggis Canapes were made by James Knight-Pacheco and Alasdair Hooper during the BBC2 programme Out of the Frying Pan for Duncan Bannatyne and his dinner party guests at his French villa. James Knight-Pacheco and Alasdair Hooper were The Restaurant runner ups in 2008. During Out of the Frying Pan they also made stovies canapes ands Arbraoth smokies canapes. The book Caribbean Food Made Easy by Levi Roots, the Reggae Reggae sauce guitar playing star of BBC Dragon's Den features many ideas from his new TV series. When Levi Roots was in Scotland he cooked his own version of Caribbean haggis. The 2009 STV series Made In Scotland featured how haggis is made. The presenter and broadcaster Kirsty Wark was shown how to make it by butcher Sandy Crombie of Crombie's in Broughton Street, Edinburgh, Scotland. Made in Scotland also broadcast the history of haggis. Since the 2008 and 2009 credit crunch and recession sales of haggis have sharply increased, especially in England. Shoppers are viewing it as a cheap and filling meal and more English stores such as M&S, Tesco, Asda and Sainsbury's are stocking haggis from Scottish butchers such as MacSweens of Edinburgh and Simon Howie Butchers of Perthshire. Marks and Spencers have reported sales in England to be as high as 35% up from 2007. This compares to a rise of 26% in Scotland Marks and Spencer shops. 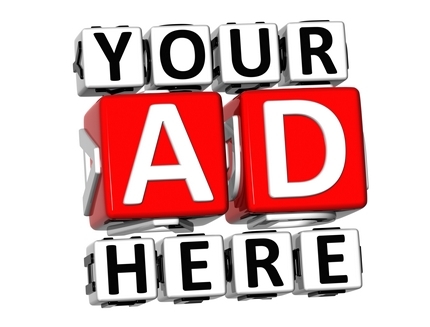 Sales have been most popular in cities in England such as London, Newcastle and Nottingham. On Friday 24 August 2007 celebrity chef Nick Nairn presented the Landward programme on BBC2 at 7pm. He went to the Borders of Scotland as part of his Border Food part of the TV series. He met Lindsay Grieve a traditional Scottish family butcher in Hawick. Lindsay Grieve showed Nick Nairn how to make traditional Scottish haggis from his secret haggis recipe that he had been using for over 20 years. Nick thought his secret ingredient may have been paprika. Other ingredients included oatmeal, Border mutton and a selection of seasoning. The award winning butcher then showed Nick Nairn how to make a batch and then put it into individual bladders. Butcher Lindsay Grieve of Hawick estimated that he makes over 160,000 handmade haggis each year. On Tuesday 1 July 2008 on the channel 4 programme The F Word chef Gordon Ramsay had a cook off with Edith Bowman the Radio 1 presenter from Fife. They cooked a haggis dish. Edith Bowman cooked a round layer of haggis, neeps and tatties whilst Gordon Ramsay baked a haggis hash brown. He lost the challenge when guests in the restaurant voted 5 points to Edith Bowman and 0 points to Gordon Ramsey. They also tried the Scottish delicacy of deep fried mars bars which Gordon could not swallow and had to spit into the bin. Edith Bowman ate all of hers! 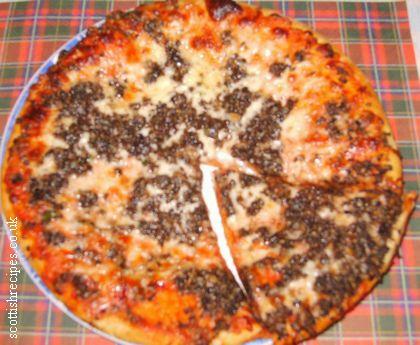 A delicious haggis pizza is made by Cosmo Pizza. This pizzeria style meal combines the great tastes of Scotland and Italy from a company who have been Italian cooking in Scotland for over 50 years. The combination of mozzarella cheeses, tomatoes and haggis gives a succulent light taste and only takes 8 to 14 minutes to cook depending on the oven temperature. We purchase ours from Tesco and more information can be found at www.cosmoproducts.com who are based in Bonnyrigg, Midlothian, Scotland. Microwave haggis is available from Macsween and cooks for one minute. The Sunday Post Scottish newspaper published the results of a survey on haggis on the 25 April 2010. It found that 1 in 5 English people think that it is a wild animal that roams in the Highlands! The Sunday Post suggested that a colony of wild haggis could be found five miles north of Brigadoon! 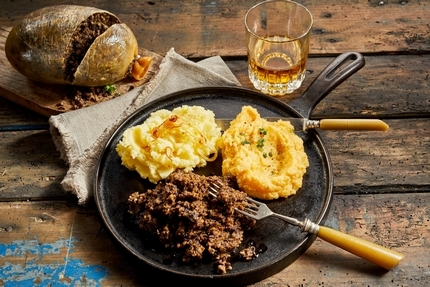 Taste Ye Back: Great Scots and the Food That Made Them has a traditional haggis, neeps and tatties recipe by top Scottish chef and cookery writer Sue Lawrence. Her other book, A Cook's Tour of Scotland, describes how butchers make it and gives away some of their seasoning secrets along with details of how to make haggis lasagne, rolls, or in pitta with tzatsiki and the Stein Inn haggis toastie.